If you think the Channel tunnel is an odd way to cross a border, you’re in for a few surprises from us. We tend to think of border lines as being fixed and unchangeable. There’s something comforting about the notion that a border is patrolled and protected but that’s not the case with some of the borders we come across. Take the border of Poland and Ukraine as an example. The border of Poland and Ukraine is the most crossed eastern European border. Trade and shopping tourism tends to be the result of most of the crossings. There are 8 million people living in the area around the border which is heavily guarded as it can be a major smuggling route into the EU. It’s also pretty unique because portions of the adjacent lands are marked with the same fish symbol. It’s known as “Land art – art on the border” which was commissioned to celebrate Transborder Good Neighbour Days. The fishes are identical and each “swims” across both sides of the border. If crossing the border the more traditional method doesn’t appeal, you could try and fly in using a zip line. Tourists can actually do this if they’re brave enough. The zip line is the creation of English businessman David Jarman who was inspired to link the two nations as plans for a bridge between Portugal and Spain keep being put on hold. 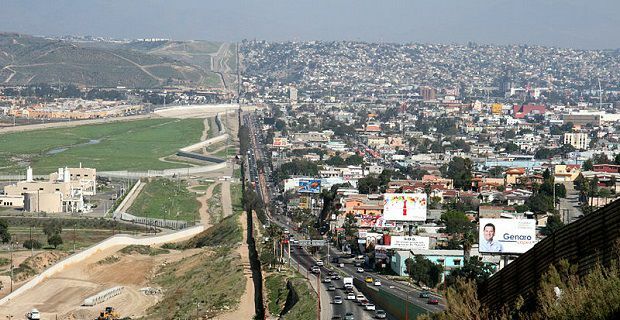 The border separating Mexico from America has to be seen to be believed which is why it’s our lead image. Look at the difference between the American way of life on the left and the way Mexicans live on the right. The contrast is amazing to see. In Tijuana, Baja California the roads are packed with commuters while in San Diego, California there’s hardly a car in sight.